In my university days, a big part of my time was taken up playing basketball. We were competing on a serious level, with multiple training sessions during the week plus a game on the weekend. During this time, I learned a lot about what it means to be part of a team. It is the last year of my university and the season is about to begin. Any other season and I would be pretty nervous right now. How will we perform? Have we trained enough? Have the other teams gotten better? Are we too old or too young? Not this time though. I am calm. And so is everybody else. Not because our team changed. No star recruits. We have the same team as last year. We are feeling this way because we are playing together extremely well. Everybody has their role and plays within it. We all know our strengths and weaknesses. And most importantly, we got a clear focus on our goal. In other words: We are aligned. No one is on a private mission. There is only one objective, and everybody is 100% behind it. And it feels great! Fast forward 15 years and the concept of teamwork is on my mind once again. As a team lead, one of my main responsibilities is to ensure consistently high performance. It took me a while to connect the great teamwork I experienced in basketball to building an extraordinary team at work. Everything made sense all of a sudden when reading an article about Elon Musk's Vector analogy. 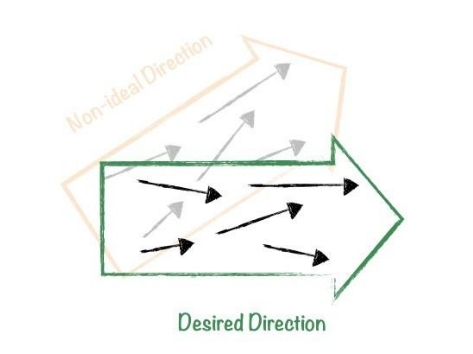 Musk refers to people as vectors, who have both direction and magnitude. Depending on how well these vectors line up, they either add to or subtract from each other. Reflecting on my basketball team in this light, I now understand that we were (close to) 100% aligned. The team was better than the sum of its individuals. The size of the team and its people. A shared vision (see Peter Senge's The Fifth Discipline). The company culture and values. There is another - potentially even the first - challenge in creating alignment: How do we know we are successful? In rare cases - like my basketball team - you can feel it. The team is in a flow state. But what about everything in between? It would be great to identify the level of alignment within a team. What does success look like for you personally (in your role)? What does success look like for the company? One really wants to ship code. That is their measure of success. The other is customer focused. Building features that are most impactful for the user. Similar insights can be gathered on the team, department and company level. Some answers might be similar - especially in a company with a strong vision and mission. In most cases though, you will be able to uncover some fundamental differences. How aligned are the answers on each level? How do the levels align with each other? It is crucial to understand how well the team is working together. And to find out we look at the alignment of the survey answers per level. In general, the higher the alignment between team members, the better the chances of high performance. Everybody is working towards the same goal and is clear on how to achieve it. On the other hand, you can be in an unfortunate situation with a high degree of misalignment. With lots of different agendas, the chances of a high performing team are slim. Do the answers complement each other? For example, it is a great match if one person wants to teach, and another wants to learn. Are there any obvious clashes? One answer might be defining team success as having a high monetary impact, another to build quality systems. Is there a single outlier, or is the group generally going in different directions (as illustrated in the diagram)? A team can be crazy aligned, but if it is running in the wrong direction it will not be very helpful. We want to get a sense for where the group as a whole is heading, by analysing the hierarchy of answers. Do the answers to success as an individual line up with the team answers? It could be problematic if the team's goal is to improve the user experience, and some folks are only interested in tweaking the search algorithm. Do the answers to team success line up with the company level answers? In case company success is getting more people on the website, there might be an issue if the team's success is to cut marketing spend. Do the answers to company success match up with the actual company goals? Great! We have a way to get a rough sense how well aligned we are. Now to the interesting bit: How to fix it. I have categorised the tools once again into Misalignment and Misdirection. When applicable, I will also mention which levels in the organisation are best suitable. However, most of the approaches work across the board. For example, having shared values is as important on a team as on the company level. 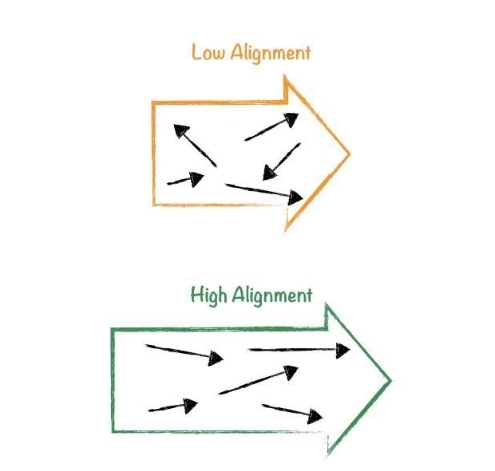 Reminder: Misalignment happens when a group (or a group of groups) is not working well together. The combined output is far from ideal because group members are not working together well. Not having a common understanding of how to behave at work is one of the most common causes of misalignment. Is it more important to make money or look out for the customer? More important to deliver or learn? Values are a way to define those guiding principles. They explicitly tell us how we expect each other to show up at work. In most cases, values are useful at the company level, but they can also be effective when applied to teams. Plenty of uncertainty surfaces when it is not clear who does what. The impact surfaces in two ways. Firstly, we waste effort when people double up on a piece of work. Secondly, we put projects into jeopardy because no one is looking at a super important task. Assigning explicit roles and their related responsibilities onto members of the team can help. It is a form of social contracting, which ensures everybody knows what to do and that there is minimal guesswork. A popular framework for this is RACI (responsibility assignment matrix). Transparency is one of those buzzwords that gets overloaded a lot. But the way I understand it, it is one of the most important tools to increase alignment. Everything is communicated in the open. Discussions are accessible, decisions are shared, and ideas are published early. A high degree of transparency gives everybody the same context, which makes close collaboration a lot easier. Reminder: A group is misdirected when their output is not in line with what the next level up expects. For example, if company success is getting more people on the website, but the team's success is to cut marketing spend. Goals, targets, KPI's. Whatever the flavour, they do one thing very well: Make it clear what is expected of you and your team. There is no guessing after the fact. No turning around and saying 'But we didn't know that we had to do X'. Two popular frameworks I have used are SMART (specific, measurable, attainable/achievable, relevant/ realistic and timely) and OKRs (Objectives and Key Results). The former is super straightforward but has its limitations. The latter is more scalable and can be used across the whole company. I recently read The Fifth Discipline by Peter Senge and found it to be one of the most inspiring books in quite a while. Among 4 other disciplines, building a shared vision is one of the cornerstones of an effective organisation. And it really is. If there is no clear bigger picture - no answer to the question 'What do we want to create together?' - getting misdirected is quite easy. And as a bonus, it works great with a well-defined goal setting process. It takes a lot of determination and grit to see something through, and one major aspect is to repeat, repeat, repeat. Without, any new process, tool or approach will fail. If people are not hearing the message over and over again, they will eventually divert from the path. A high degree of alignment is crucial when building a great team. The first step is to understand what the landscape looks like. Are the members of your team misaligned, misdirected or even both? Once you have a clear picture where alignment could be improved, you can apply some proven processes and frameworks to help your team and even your whole organisation level up.